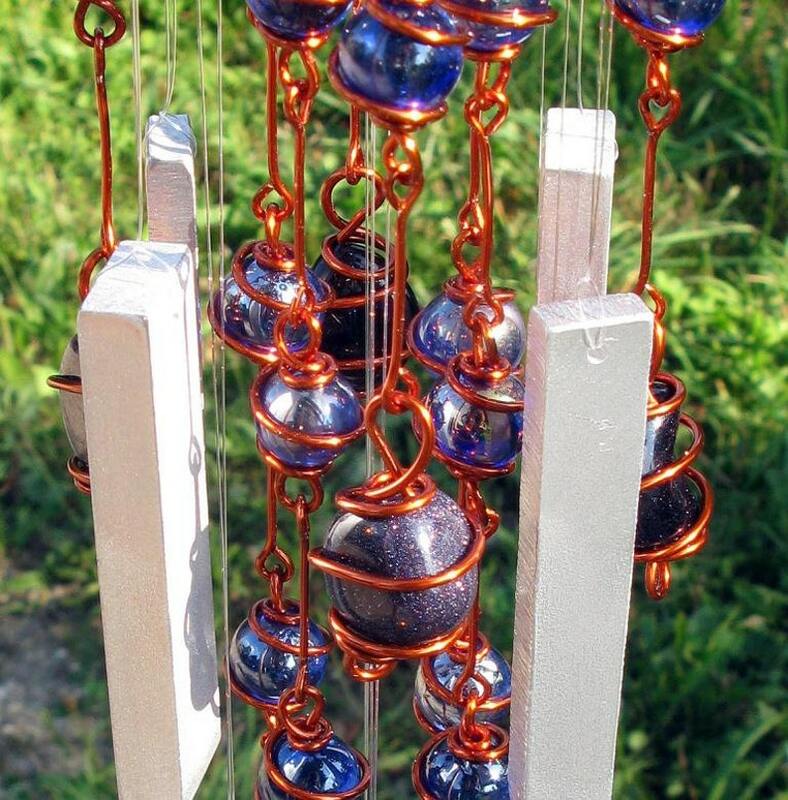 This unique windchime features 72 iridescent blue glass marbles, individually hand-wrapped in solid copper wire with an enamel finish (to retard tarnish). The top frame is solid aluminum so there's nothing to rust. It is accented with 8 pieces of Blue Goldstone. Goldstone is a man-made glass with suspended copper flecks. Different theories attribute it's origin to either medieval French monks or 17th century Viennese glass makers acting on order of the Doge. Metaphysically, Goldstone is a stone of protection as it helps deflect unwanted energies. It is also a stone of success as it aids with ambition, drive and the attainment of goals. Either way, it's pretty sparkly stuff! Every chime comes complete with a "cheat sheet" that summarizes it's metaphysical properties. The sizes and shapes of the Blue Goldstone pieces will vary from windchime to windchime.